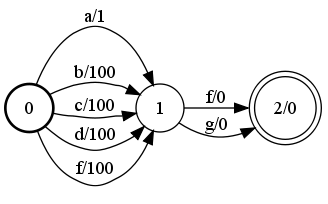 This operation randomly generates a set of successful paths in the input FST. The operation relies on an ArcSelector object for randomly selecting an outgoing transition at a given state in the input FST. The default arc selector, UniformArcSelector, randomly selects a transition using the uniform distribution. LogProbArcSelector randomly selects a transition w.r.t. the weights treated as negative log probabilities after normalizing for the total weight leaving the state. In all cases, finality is treated as a transition to a super-final state. where N = number of paths to be generated, L = expected length of a successful path according to the considered arc selector, cT = time required for randomly selecting an arc, and cS = space required for randomly selecting an arc.